Despite the impact of the economic crash, the growth in digital options and government proposing cash restrictions, cash is still a preferred payment option in Spain. According to the latest PYMNTS Global Cash Index™ Spanish Edition (a Cardtronics collaboration), 'when it comes to the cold, hard stuff, Spaniards are less than willing to give up on their payment of choice'. From 2nd February-31 May 2017, the European Commission open consultation for their prosposed 'EU initiative on restrictions on payments in cash' in order to 'counter terrorism financing'. The Spanish government have also proposed lowering the limit on the amount of cash per transaction within Spain from the previous limitation of €2,500 to €1,000. The measure, designed to tackle tax fraud, was to be approved by the Council of Ministers on Friday 2 December 2017. On 21 December 2016, the European Commission proposed to extend the already existing controls on amounts of cash entering or leaving the Union equal to or in excess €10,000. 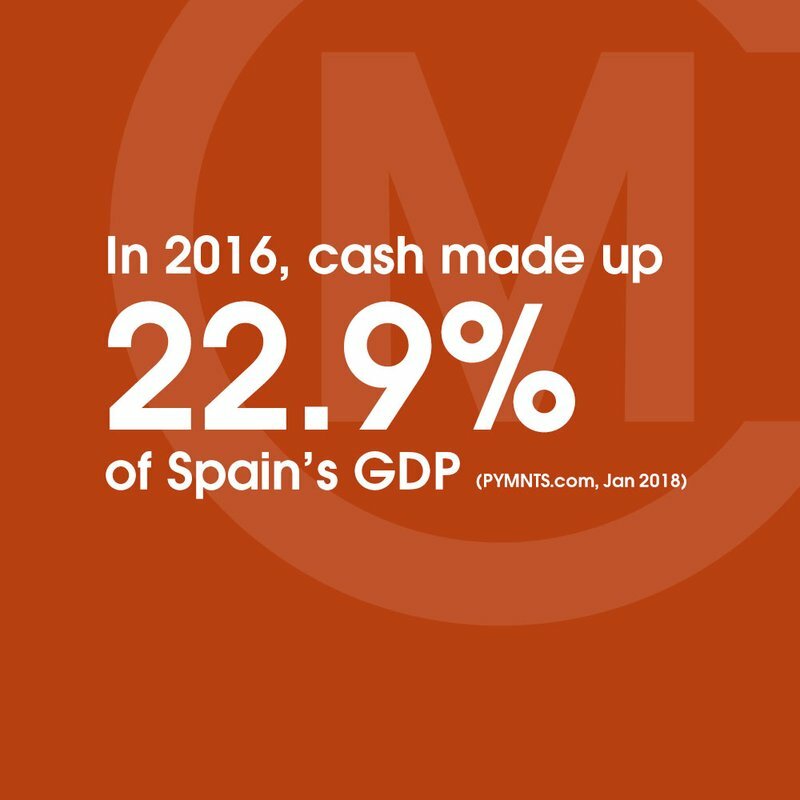 There are several factors contributing to Spain’s ongoing love affair with cash and its preference for the payment method over newly available ones. First, the country has a higher rural population than many neighbouring nations, and that group tends to favour cash for its ease of access and security. Another factor is its thriving underground economy, a byproduct of the global financial crisis of 2009 and the burst of the real estate bubble. Recent estimates peg the value of Spain’s underground economy at roughly 16 percent of the nation’s overall gross domestic product (GDP). Some recent policy changes could lead to a slight decrease in cash’s influence, however. The Spanish government is taking measures to reduce parallel economy influence by putting cash in its crosshairs. It recently imposed limits on cash-based transactions for citizens, a move that could undermine the payment method’s influence in Spain’s financial ecosystem. Despite government intervention and the advent of new technology, cash clearly still thrives in Spain. Meanwhile, one of the most influential financial institutions (FIs) in Spain recently took steps to make it slightly more difficult to access cash. In March 2015, CaixaBank announced it would begin charging two euros per ATM withdrawal for users without bank-issued payment cards.2 The results of Caixa’s efforts could be visibly measured last year. EU rules have made electronic payments in the euro as easy as cash payments. Banks must charge the same fees for international payments in euros within the EU as for a national transaction of the same value in euros. So withdrawing euros from a cash machine anywhere in the EU costs you the same as it does in your own country from a cash machine that does not belong to your bank... If you enter or leave the EU with 10,000 or more in cash (or its equivalent in other currencies) you must declare it to the customs authorities.